I just love making all types of cold weather clothes lately, however I just wish it would stay cold long enough here in Austin so I can wear them! 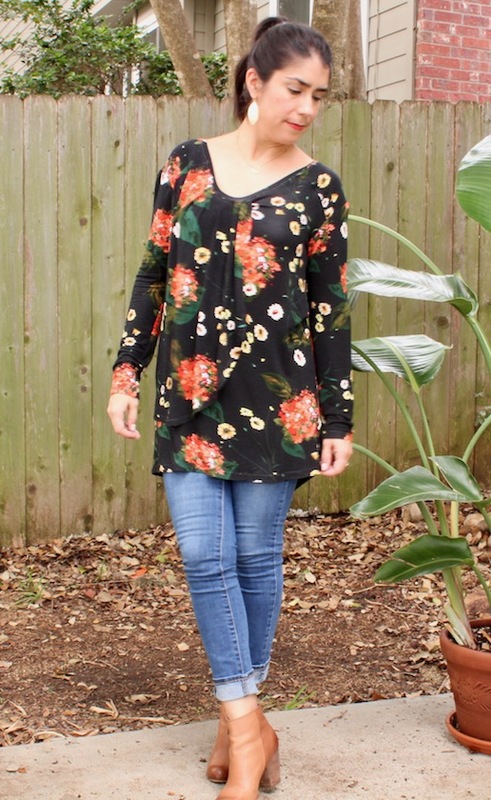 Well, as I'm sewing all these pretty new fall/winter makes, I am trying to keep in mind layers! Yes, since the weather here is so up and down I want to try to be able to have things that would work with or without a jacket, wearing something underneath or have it look cute with a light layer over it. Plus comfort is always key. 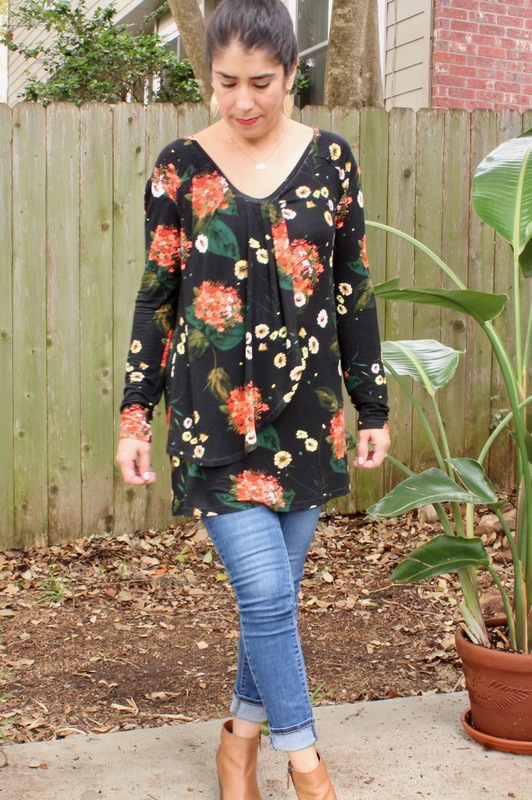 That is what I liked most about Butterick 6246, I like that it's made with a cozy lightweight knit and could be suitable to wear with leggings when the weather is warmer or layer with a denim vest or a light weight jacket and jeans when it gets colder. For this pattern, I cut out View D in size 12. The fabric is a black floral jersey knit from Joann's. 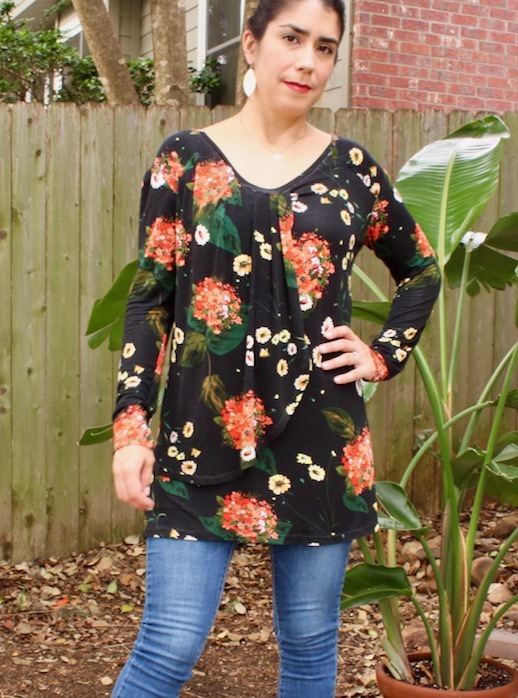 Description: Pullover tunic top that is loose fitting with a pleated front overlay. Instructions: They were very easy to follow, and it will help if you have experience sewing with jersey knit. I liked this pattern however since my fabric was pretty stretchy, it was a little bit of a pain to work with. I guess it had been a little while since I sewed with jersey so I was reminded of all the skills/knowledge that I needed. It was good practice for me. 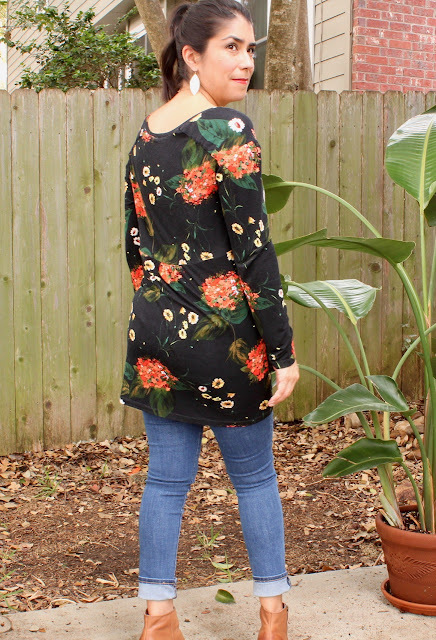 I wrote a blog post all about my sewing tips for jersey knits here. Alterations: I made no design changes. Overall: I like this pattern and hopefully I will get to make a least one more top, however I have a pretty good list of other fall/winter makes that I would like to get through.